Soundscape studies investigate and find increasingly better ways to measure and hone the acoustic environment. 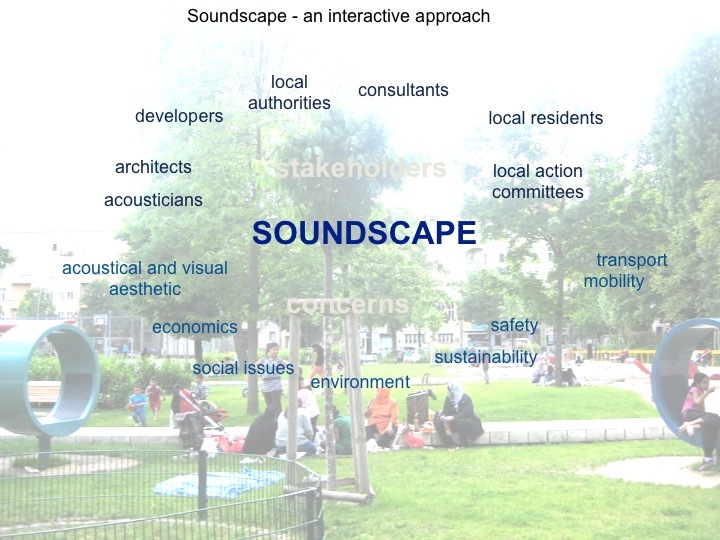 Soundscape offers the opportunity for multidisciplinary working, bringing together science, medicine, social studies and the arts – combined, crucially, with analysis, advice and feedback from the ‘users of the space’ as the primary ‘experts’ of any environment – to find creative and responsive solutions for protection of living places and to enhance the quality of life. The Soundscape concept was introduced as a scope to rethink the evaluation of “noise” and its effects. The challenge was to consider the limits of acoustic measurements and to account for its cultural dimension. Soundscape suggests exploring noise in its complexity and its ambivalence and its approach towards sound to consider the conditions and purposes of its production, perception, and evaluation, to understand evaluation of noise/ sound as a holistic approach. 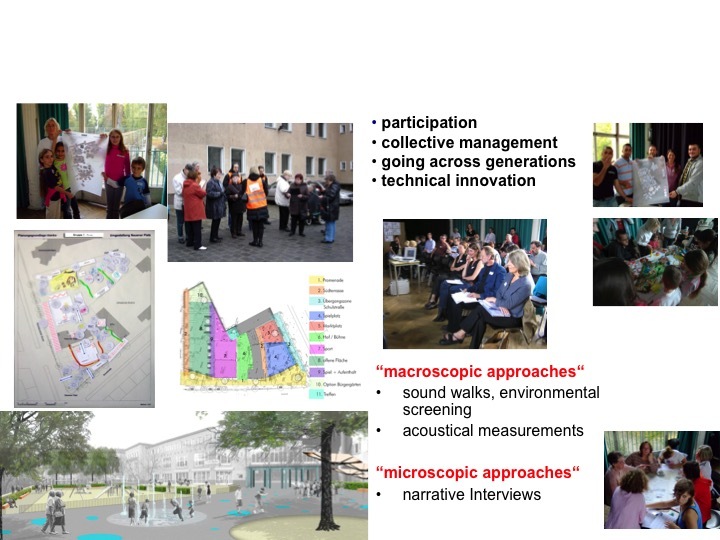 To discuss the contribution of Soundscape research into the area of Community noise research means to focus on the meaning of sounds and its implicit assessments to contribute to the understanding that the evaluation through perceptual effects is a key issue. The concept of development of the open pace relies on the understanding that people living in the chosen are the “real” experts concerning the evaluation of this place according to their expectations and experiences in the respective area. The intention of scientific research here is to learn about the meaning of the noise with respect to people’s living situation and to implement the adequate procedure to open the “black box” of people’s mind. Therefore, the aim was to get residents involved through workshops to get access to the different social groups. Interdisciplinarity is considered as a must in the soundscape approach. In this case it was concerned with the collaboration of architects, acoustics engineers, environmental health specialists, psychologists, social scientists, and urban developers. The tasks are related to the local individual needs and are open to noise sensitive and other vulnerable groups. 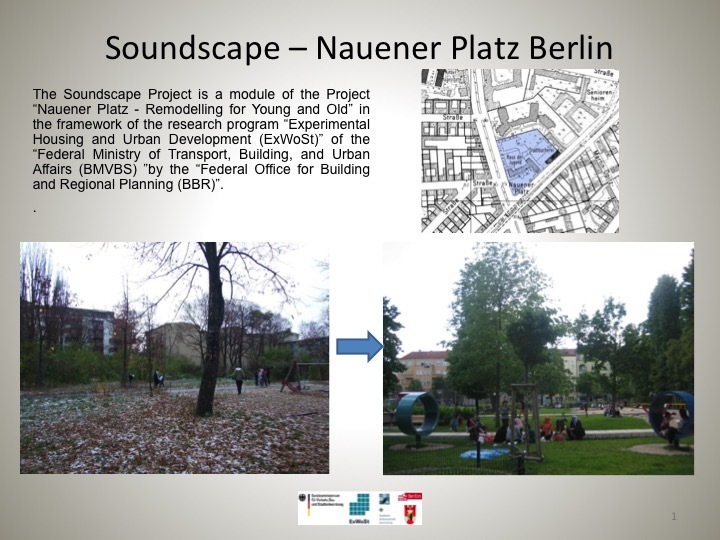 It is also concerned with cultural aspects and the relevance of natural soundscapes – sometimes referred to as quiet areas – which is obviously related to the highest level of needs. 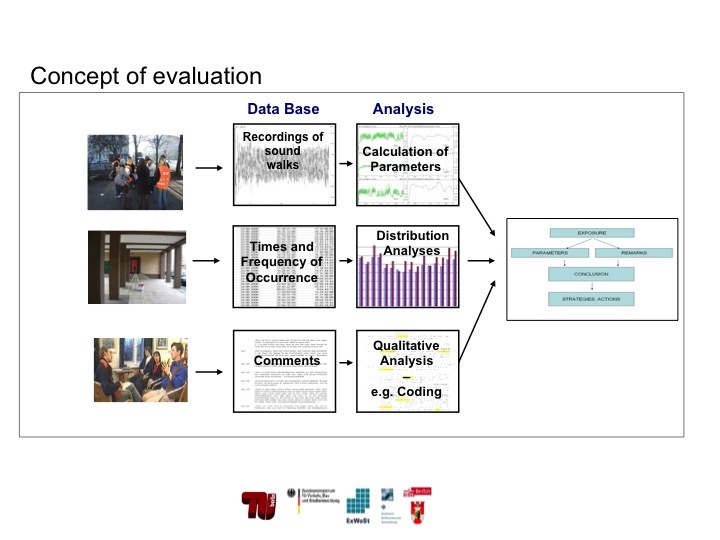 Obviously, these new approaches and methods make it possible to learn about the process of perception and evaluation sufficiently as they take into account the context, ambiance, the usual interaction between noise and listener and the multidimensionality of noise perception. By contrast, conventional methods often reduce the complexity of reality on controllable variables, which supposedly represent the scrutinized object. Furthermore, traditional tests neglect frequently the context-dependency of human perception; they only provide artificial realities and diminish the complexity of perception on merely predetermined values, which do not completely correspond with perceptual authenticity. However, perception and evaluations entirely depend on the respective influences of the acoustic and non-acoustic modifiers. 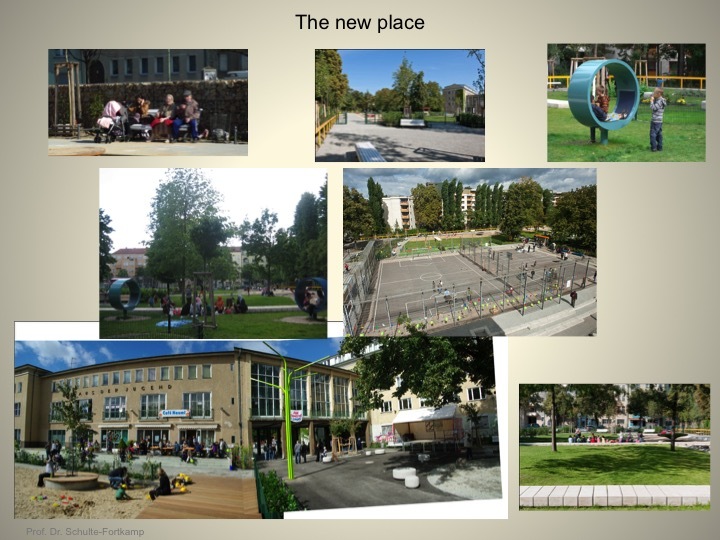 Following the comments and group discussion and also the results from the narrative interviews it could be defined why people prefer some places over the public place and why not. It also became clear how people experience the noise in the distance from the road and also with respect to social life and social control. One of the most important findings here is how people react to low frequency noise at the public place and how experiences and expectations work together. It becomes obvious that the most wanted sound in this area is based on wishes to escape the road traffic noise through natural sounds. Relying on the combined evaluation procedures the place was reshaped installing a gabion wall along one of the main roads and further more audio islands like have been built that integrated the sounds people would like to enjoy when using the place. 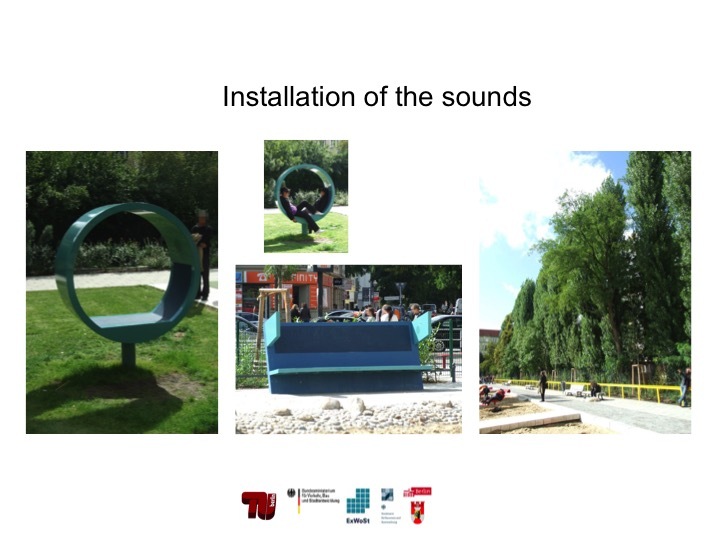 While the gabion wall protects against noise around the playground, the new installed audio islands provide nature sounds as selected by the people involved in the Soundscape approach. The process of tuning of urban areas with respect to the expertise of people’s mind and quality of life is related to the strategy of triangulation and provides the theoretical frame with regard to the solution of e.g. the change in an area. In other words: Approaching the field in this holistic manner is generally needed. An effective and sustainable reduction of the number of highly annoyed people caused by noise is only possible with further scientific endeavors in the area of methods development and research of noise effects. Noise maps providing further information can help to obtain a deeper understanding of noise reactions and can help to reliably identify perception-related hot spots. Psychoacoustic maps are particularly interesting in areas where the noise levels are marginal below the noise level limits and offer an additional interpretation help with respect to the identification of required noise abatement measures. But, the expertise of people involved will provide meaningful information. Soundwalks as an eligibly instrument for exploring urban areas by minds of the “local experts” as measuring device open a field of data for triangulation. 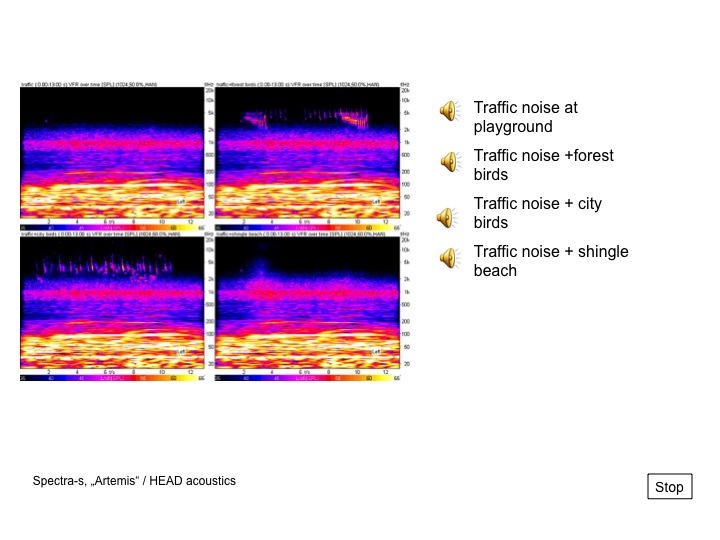 These techniques in combination allow giving meaning to the numbers and values of recordings and their analysis to understand the significance of sound and noise as well as the perception of Soundscapes by its resources. R. M. Schafer, “The Soundscape. Our sonic environment and the tuning of the world.” Rochester, Vermont: Destiny Books, (1977). R. M. Schafer, “The Book of Noise” (Price Milburn Co., Lee, Wellington, NZ, (1973). B. Truax, (ed.) „Handbook for Acoustic Ecology” (A.R.C. Publication, Vancouver, (1978). K. Hiramatsu, “Soundscape: The Concept and Its Significance in Acoustics,” Proc. ICA, Kyoto, 2004. A. Fiebig, B. Schulte-Fortkamp, K. Genuit, „New options for the determination of environmental noise quality”, 35th International Congress and Exposition on Noise Control Engineering INTER-NOISE 2006, 04.-06.December 2006, Honolulu, HI. P. Lercher, B. Schulte-Fortkamp, “Soundscape and community noise annoyance in the context of environmental impact assessments,” Proc. INTER-NOISE 2003, 2815-2824, (2003). B. Schulte-Fortkamp, D. Dubois: (editors) Acta Acustica united with Acustica, Special Issue, Recent advances in Soundscape research, Vol 92 (6), (2006). R. Klaboe, et. al. „Änderungen in der Klang- und Stadtlandschaft nach Änderung von Straßenverkehrsstraßen im Stadtteil Oslo-Ost“, Fortschritte der Akustik, Oldenburg, (2000).